From CA And IN Warehouse. 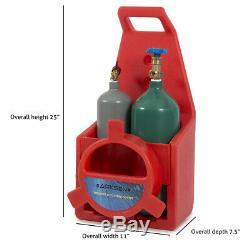 Portable Twin Tote Style Oxygen Acetylene Tank Welding Cutting Torch Starter Set. 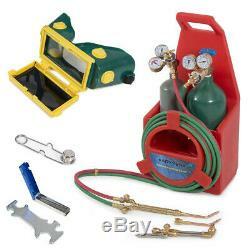 Weld iron and steel pipes or use this portable Oxygen/ Acetylene torch kit to fabricate metal artwork as well as brazing, cutting, bending and forming. The complete torch kit includes a 4L oxygen tank and 2L acetylene tank with regulators along with chrome-plated brass torch assembly with turbo lever. 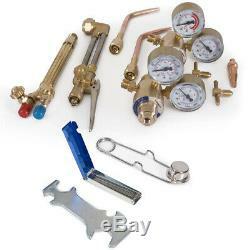 Complete gas-welding accessory kit includes a 4 liter oxygen tank and 2 liter acetylene tank with regulators, along with full brass torch assembly. A light to medium duty portable outfit that is extremely popular for general maintenance work, metal sculpture, automotive repair, air conditioning, refrigeration etc. Carrier is made of tough, lightweight polypropylene. 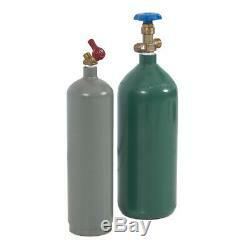 Use this oxyacetylene torch for welding pipes and tubes, and other metal repair work. Able to fabricate metal artwork. Color coded hose for Oxygen and Acetylene. Use it for iron or steel welding, braze-welding, plus brazing, cutting, bending & forming. Material: Brass Torch, Poly Carrier. 5"in x 3/16" inside diameter. Torch Inlet Thread: 9/16in x 18. Hose Fitting Threads: Oxygen: Right-Hands Acetylene: Left-Hand. 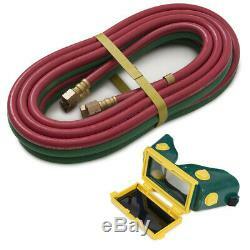 Hose Type: Color Coded Twin Hose - Green : Oxygen, Red : Acetylene. Nozzle size(s): #0-3-101 Cutting / #0 Welding. Welding Tip 1 and 2. (tanks are not DOT approved). TheEveryMart is one of America top online suppliers of specialized Home Furniture, Home Appliances, Garden products, and High Quality Aftermarket Car Parts. For over 10 years, TheEveryMart has been providing customers years of insurmountable service. Our highly trained, professional staff provides in-depth knowledge and exceptional personal assistance to customers worldwide. Our number one commitment is to provide unbeatable service at unbeatable prices. Founded in the heart of Los Angeles California, our 400,000 sq/ft warehouse houses thousands of the most comprehensive collection of household tools, home & garden and aftermarket automotive items to fit any of your needs. TheEveryMart works closely with product manufactures, eliminating middlemen so we can pass the savings onto you. We look forward to building upon our tradition of excellence by continuing to provide exceptional products and services. From California - Los Angeles. Protective packing materials will be added in your package at no cost if needed. Assures our customers that they will receive all orders promptly and exactly as described. Used items will not be accepted for return. Under no condition will TheEveryMart be liable for any damages, and in particular will not be liable for special, indirect, consequential, or incidental damages, or damages for lost properties, revenue or use, arising out of or related to the TheEveryMart account or the information contained within it, whether such damages arose in contract, negligence, tort, under statute, in equity, at law or otherwise. Who do I contact if I receive a damaged product? If your product is damaged, you may use the contact form provided. We have warehouses in California and Indiana. How long until my order ships? How do I cancel my order? You have 24 hours from the time you place your order to cancel. Do you deliver on weekends? &###xA0; Why isn't my coupon working? Your coupon may have expired. Only one discount applies per order. Are there promo codes / coupons available for me? As a member of the Belleze community, you may receive special discounts and promotional codes from time to time. You may also see discounts on banners and notifications on our web site. Do you have a showroom? We are only online at this time. Do you offer wholesale prices? We do not offer wholesale pricing. Do you offer any installation services? We do not offer installation services. I received an incomplete order missing parts, manual, etc. Why was my order cancelled? This listing is currently undergoing maintenance, we apologise for any inconvenience caused. The item "Portable Twin Tote Style Oxygen Acetylene Tank Welding Cutting Torch Starter Set" is in sale since Monday, March 11, 2019. This item is in the category "Business & Industrial\CNC, Metalworking & Manufacturing\Welding & Soldering Equipment\Welding\Welders, Cutters & Torches\Gas Welding Torches". The seller is "theeverymart" and is located in Rowland Heights, California. This item can be shipped to United States.